We make a classic batter which is flavoured with rosemary. The mini sausages are from Speldhurst, a traditional butchers from Kent who have been making sausages for 50 years. They are marinated in beef stock and onion marmalade to give a gravy flavour too. Sausages (33%) [Sulphites] (contain: Pork Cuts (Pork Shoulder, Pork Belly), Water, Rusk (Wheat Flour (Calcium Carbonate, Iron, Niacin, Thiamin)), Salt, Spice & Spice Extracts, Sugar, Herbs, Citrus Fibre, Dried Leek), Semi Skimmed Milk (22%), Wheat Flour (16%) (contains: Wheat Flour, Calcium Carbonate, Iron, Nicotinamide (Vit B3), Thiamine Hydrochloride (Vit B1)), Free Range Pasteurised Whole Egg (15%) Pink Onion Marmalade (5%) (contains: Rosanna Pink Onions, Balsamic Vinegar, Light Brown Sugar, Malt Vinegar, Tapioca Starch, Salt), Water, Beef Glace (contains: Beef Stock (Water, Beef Stock), Flavourings, Yeast Extracts, Glucose Syrup, Salt, Sugar, Maltodextrin), Rapeseed Oil, Salt, Rosemary. Preheat oven. Remove sleeve and film. Place the tray directly onto a baking tray. Cook in the top of the oven. Rest for 2 mins before serving. 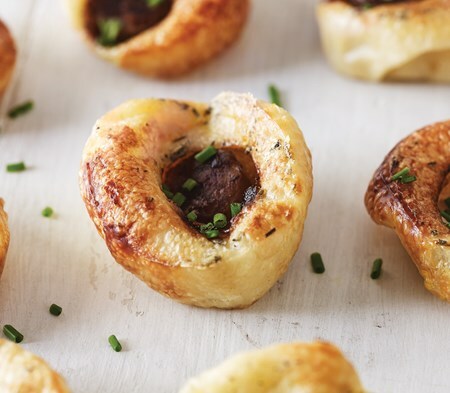 When cooking more than one pack of canapés at a time, allow extra cooking time.